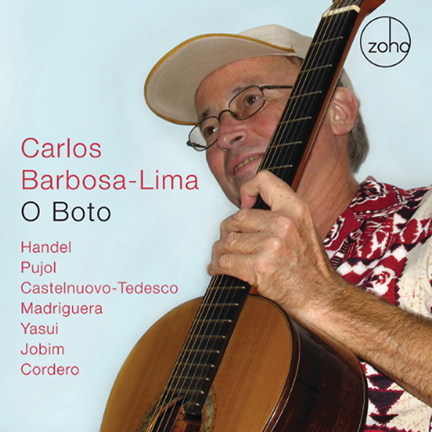 “O Boto” (“The Dolphin”) is the Brazilian acoustic guitarist Carlos Barbosa-Lima’s most ambitious recording project to date  covering three centuries of solo guitar and guitar & orchestra repertoire, spanning the globe from Europe to the Caribbean, and from the jungles of the Amazon to the Hawaiian islands. Originally released on Concord Records in 1997, O Boto has long been the most sought-after, but hard to find CD title within Barbosa-Lima’s now out-of-print Concord catalog of the 1980s and 90s. It is now being re-released in new packaging as the fourth Carlos Barbosa-Lima title in the ZOHO catalog, following the critically acclaimed Siboney (2004), Frenesi (2004) and Carioca (2006). In his five decades as a performing and recording artist, Barbosa-Lima has shaped the contemporary classical, jazz and Latin American acoustic guitar repertoire like few others: his repertoire ranges from Bach and Scarlatti to Gershwin, Debussy, Cole Porter, Jobim and Brubeck. Many contemporary composers have written music for him, including Alberto Ginastera who wrote his landmark Guitar Sonata op. 47 in Barbosa-Lima’s honor. A commanding, robust, musical figure of the Baroque, George Frederic Handel set the musical world on its ear with his compositional style. To think that he would take the time to write a harp concerto! He did, and the result, as would be expected, was beautiful. However, to take this work and turn the harp into a guitar seemed a little bold: Carlos Barbosa-Lima decided in 1975 to arrange Handel's Harp Concerto and produced an orchestrated version. The end result? A beautiful addition to the guitar repertoire and a most agreeable listening experience. Born in Spain, Emilio Pujol Vilarrubi (1886 - 1980) is considered by many as the leading spokesman for twentieth century guitar pedagogy. Pujol began his studies with Francisco Tárrega (1852 - 1909) at the Conservatory of Barcelona in 1901. Pujol gave his first recital in Lerida in 1907. From 1912 to 1929 his concert activities took him mainly throughout Western Europe. During the years 1914-1918 (World War I) he did not travel much and mainly remained in the Catalonian region of Spain. Pujol left behind him many musical compositions registering his own personal talent, of which one is heard here with Carlos' rendition of the Tonadilla. 1995 marked the centennial of Mario Castelnuovo-Tedesco’s (1895  1968) birth in Florence, Italy, where he began piano studies with his mother at age nine. He later studied at the Conservatory in Florence and took degrees in piano and composition. Prior to 1925 he established himself by playing his own works and accompanying interpreters of his songs. He came of age at a time when French and Spanish Impressionist music was first being played. There was also the cultural connection with Spain. The Castelnuovo family was of Sephardic origin and his grandfather collected original Hebrew themes which Castelnuovo-Tedesco later used in some of his own compositions. Capriccio Diabolico for Guitar and Orchestra, op. 85b, was originally composed for solo guitar and dedicated to Andrés Segovia in 1932. Segovia had asked for a work that would reflect the style of "one of your countrymen, Nicolò Paganini." The results: the Capriccio Diabolico, op. 85, in one movement, a quasi fantasia for solo guitar. Some years later, after the First Concerto for Guitar and Orchestra, op. 99 (Carlos premiered this work in Brazil) was completed, performed and recorded, Segovia asked for another composition for guitar and orchestra. At this time, one or the other suggested the idea to orchestrate the Capriccio. It was completed in 1945. Enric Madriguera (1902  1973) was born in Barcelona, Spain. Like his older sister, Paquita (noted Spanish pianist, 1900-1965) he too studied with Enrique Granados but concentrated more on the violin. Both were considered child prodigies. In 1916, Paquita was contracted to perform in New York. Enric was also allowed to travel with her and eventually to perform at the Aeolian Hall, accompanied by his sister. To complement his meager allowance he would play with American dance bands. By the age of twenty, traveling throughout the Americas, the Caribbean and Europe, he conducted some of the major orchestras and developed an international following. His life took on a whirlwind of musical activity: orchestra leader at the Havana Casino; classical violinist at the Hippodrome Theatre in New York; Musical Director for Radio Station WNYC; Director for Latin Musical Programming at Brunswick Records and later, in the same position, for Columbia Records., Adiós was probably written for his young love, Anais Nin (later a well known writer). Born and raised in Honolulu, Hawai'i, Byron Yasui (1947) began the study of music at an early age. From the study of brass instruments to ukulele and eventually to double bass he became a freelance jazz musician working with noted artists such as Louis Bellson, Benny Carter, Barney Kessel, Charlie Byrd and other noted jazz legends. Since 1964, he has been a regular performer with the Honolulu Symphony Orchestra performing on many and varied instruments such as the harp, banjo, guitar, 'ukulele; exotic instruments such as Koto, Kugo (ancient Japanese harp), and Samisen. He is now on the music faculty at University of Honolulu chairing graduate studies in music. Antonio Carlos Jobim (1927  1994) grew up in a house in which two uncles played guitar: one, in the Brazilian samba and chôro style; the other played Bach, Albeniz, Sor and Tárrega. Yet, his early training was strictly classical with the piano as his main instrument. Jobim's name is now synonymous with "bossa nova," ("new twist" or a "new wrinkle"). Bringing Brazilian samba and American jazz together with the whispering voice of João Gilberto, Jobim led the bossa nova movement throughout the World. "O Boto" is based on an old Brazilian legend about a fish with magical powers. "O Boto," an enchanted white dolphin, turns himself into a handsome man and denudes the virgins living within the forest. Byron Yasui, who orchestrated the work, found this legend to be similar to one he learned of in Hawai'i. As a result, the orchestral timbres resonate with brilliant effect the legend of "O Boto." One of Puerto Rico's outstanding composers, Ernesto Cordero (1946) is Professor of Composition and Guitar at the University of Puerto Rico, a position he has held since 1971. In Nana para una Negrita, the listener experiences the many colors and timbres of the guitar. There are percussive effects and 'bong' like sounds (the composer has written a notation asking for the guitarist to "cross the bass strings, one over the other") with a lazy like tropical atmosphere, followed by strident Mulato rhythms and continuing with unusual percussive effects. This is a marvelous piece which captures the impression of the Caribbean. Concierto Antillano para Guitarra y Orquestra (1983) is but one of four concertos he has composed for the guitar. The work Antilles Concerto is based on the composer's love relationship with the West Indies, describing the sounds of the people and the culture of the Caribbean. As the composer notes: "This work portrays, from my own spiritual perspective, the landscape of the Antilles, a region that, despite its diversity, is threaded by a common culture. It is an homage to the three Spanish speaking islands of the Greater Antilles: Cuba, the Dominican Republic and Puerto Rico." Recorded in March 1997 at Salle Bulgaria, Sofia, Bulgaria. Re-released under license from the Concord Music Group, Inc. Engineer: Atanas Baynov. Photography: Sergio Royzen. Package Design : 3 & Co, New York. www.threeandco.com Produced by Heiner Stadler. Executive producer of ZOHO re-release : Joachim “Jochen” Becker.